Empower your sellers with savvy insights that engage and delight customers. Scale the power of one-on-one relationship selling by unifying the sales experience. Offer your team tools to reinvent the way they sell and help transform your company’s bottom line. 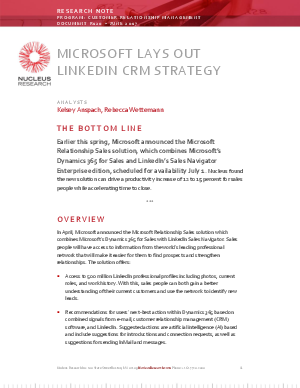 Use Microsoft Dynamics 365 for Sales along with LinkedIn Sales Navigator to help sellers identify future customers and suggest ways to engage with them.